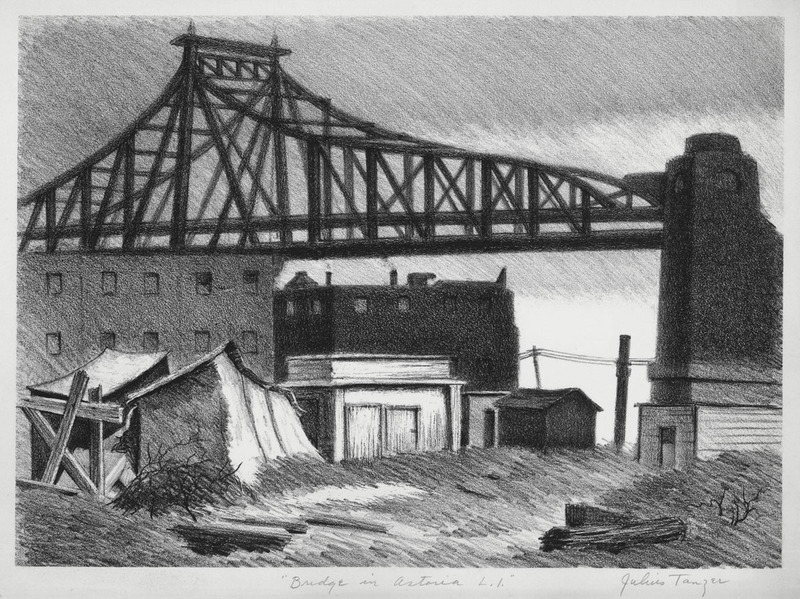 Lithograph, image size 10 1/4 x 14 3/8 inches, c. 1940, pencil signed and titled, "Bridge in Astoria, L.I." Tanzer was active in New York during the depression and was a member of the WPA. Lithograph printed in 1939. Edition of 25. Pencil titled in the lower left, signed and dated in pencil in the lower right. Plate measures 13 1/4 x 9 7/8 inches on 18 x 12 3/8. A delightful print full of light and movement. 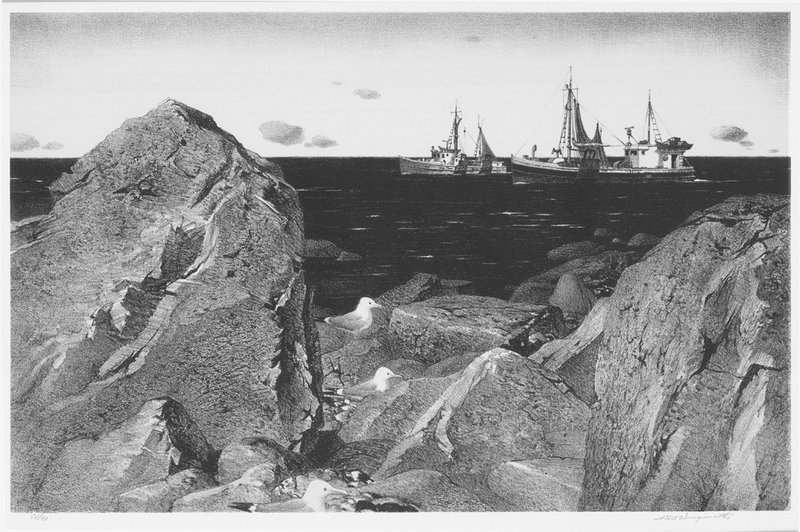 Lithograph of Rockport, Massachusetts from December 1965. Edition of 40. Stuckey 301. 10 x 15 3/4 inches on wove-type paper. 9 3/8 x 11 1/2 inch etching and sandpaper ground on wove type paper, ed. 100. Cat: Giardina 193. Printed in 1937. Pencil signed "Kerr Eby imp", the "imp" indicating that Eby printed this impression himself. Kerr Eby was a remarkable printmaker and a member of the Cos Cob Art Colony and friends with many of the important artist of the day, including Childe Hassam and John Taylor Arms. Eby was known for his atmospheric renderings of the New England landscape as well as his dramatic images of WWI. C. 1935. Catalog: Fletcher 284. Edition of 153. #12 in the Spanish Church Series. Plate measures 9 1/2 x 12 1/4 inches on 10 5/8 x 14 7/8 inch watermarked laid paper. Pencil signed in the lower right and dated 1935. In the lower left: "To my dear friends Charlotte and Richard Perry, John Taylor Arms 1935." This print has a wide tonal range, with a variety of different intricate line patterns to convey shading and texture. John Taylor Arms was one of the foremost American printmakers of the 20th century, known for his exquisite compositions and exacting details. 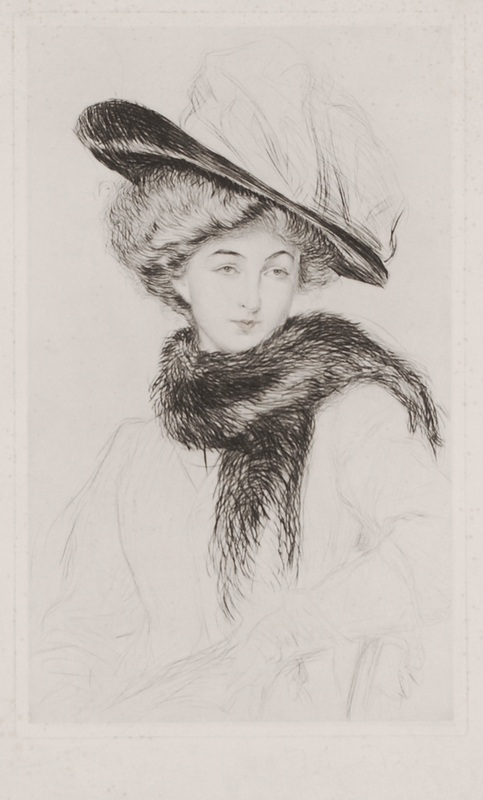 A drypoint etching C. 1920. Pencil signed and dated in the lower right, plate signed and dated in the lower left. Plate measures 8 x 11 3/4 inches on 9 3/4 x 15 3/4 inch wove paper. 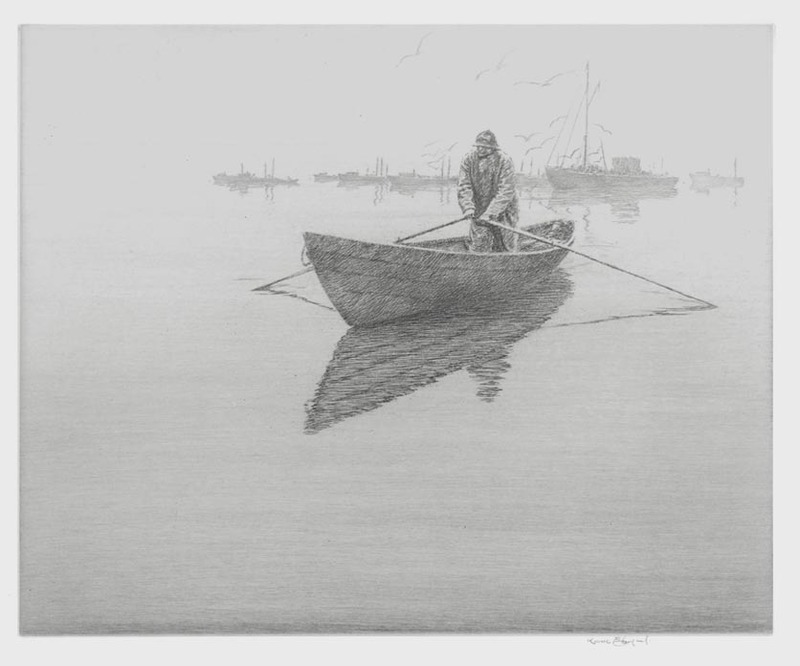 Meyerowitz studied at the National Academy of Design in NY and is best known for his development of producing etchings in color. His work is at the Metropolitan Museum of Art; Carnegie Institute; National Academy of Design; Harvard University and the Library of Congress. 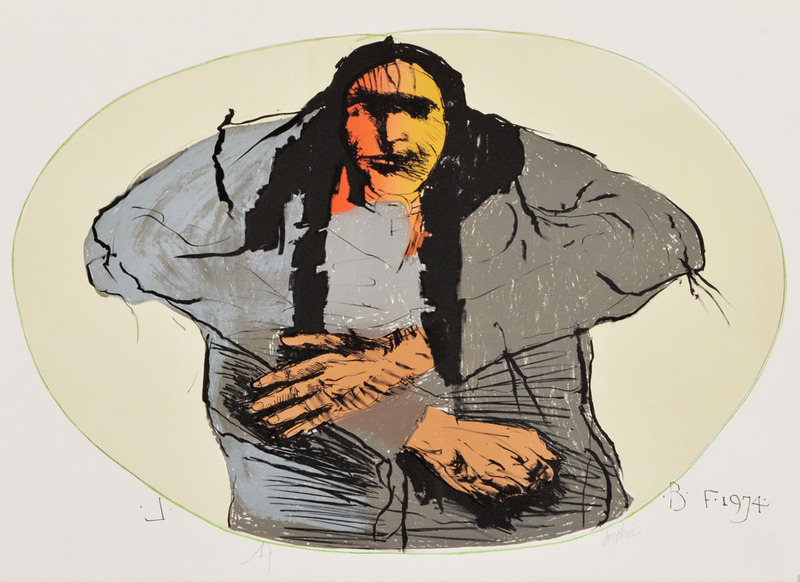 This is a vibrant original lithograph in colors by American artist Leonard Baskin. 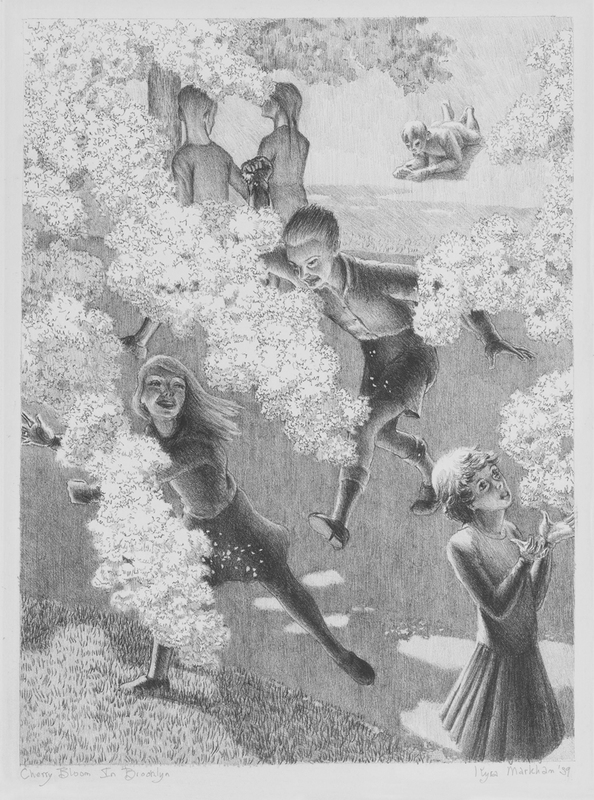 The image size is 24 1/2 x 36 1/2 inches oval, 1974, cat: Fern & O'Sullivan- 655, artist's proof apart from the published edition, pencil signed and notated "AP", printed on a full sheet of Arches paper with deckle edges. Leonard Baskin was an important artist in the mid 20th century, known for his evocative wood engravings, lithographs, and etchings. In the era of abstract expressionism, Baskin’s work tended toward the representational with a strong classical influence especially in his sense of composition and structure. In the 1970s Baskin created a series of striking large scale portraits of Native Americans to honor and highlight their role in the history of our country. This is an original hand signed etching by American artist Isac Friedlander. 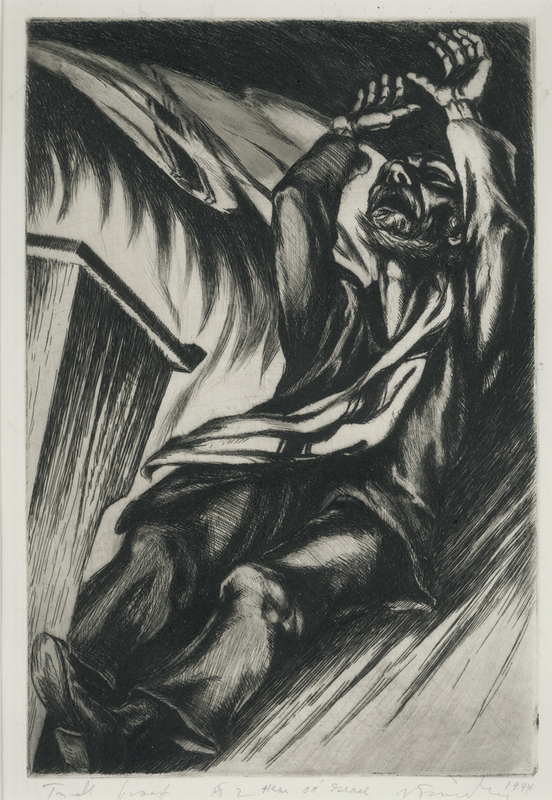 The title of this work is "Hear Oh' Israel", it was created and printed in 1944. One of the artists War aftermath motifs . This etching is inscribed as Trial Proof #2, from the later published edition of 50. The image measures 14X9 1/2 inches.Isac Friedlander (1890-1968) was born in Mitau, Latvia. He was arrested in 1906 and imprisoned by Russian authorities for anti- Czarist Political activities from 1906 to 1912. He studied art at the Academy of Rome, Italy from 1913 until 1917. He was a friend of Russian writer Maxim Gorky. Friedlander began his printing career in 1915. In 1917 he repatriated to Russia during the Kerensky regime, but in 1929 Friedlander immigrated to the US with the encouragement of his cousin Joseph Hirshhorn. 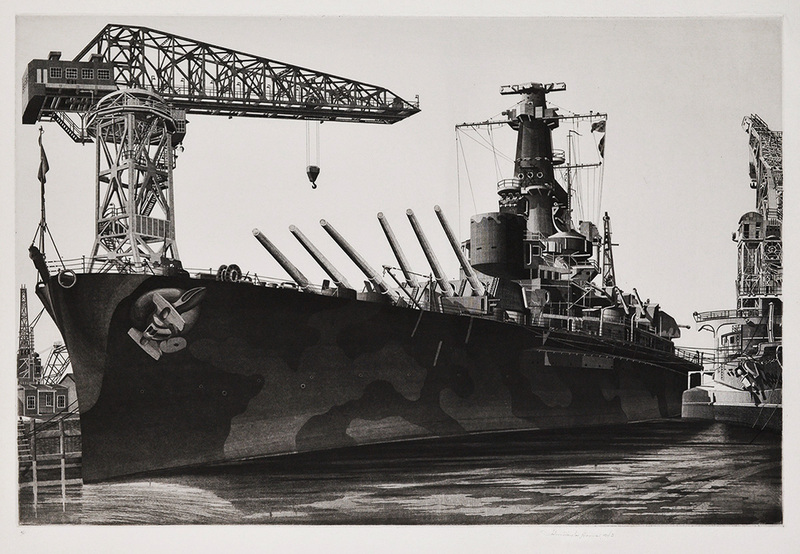 A great image of a WWII battleship by John Taylor Arms, this etching with aquatint measures 12 x 18 inches, #1 of Arms' "U. S. Navy Ship Series," published in 1943, state 3 of 6, pencil signed and dated lower right, numbered "VI" lower left, cat: Fletcher-376. This is a rare early state proof before the plate was steel-faced for the fourth state. John Taylor Arms was an extremely talented and successful artist in the early 20th century, known especially for his exquisite renderings of French cathedrals and other European architecture. He served as a naval officer during WWI and at the onset of WWII was ready to serve again, but did not meet the Navy's physical requirements. Instead, Arms created his "U.S. Navy Ship Series," to support the American war effort. 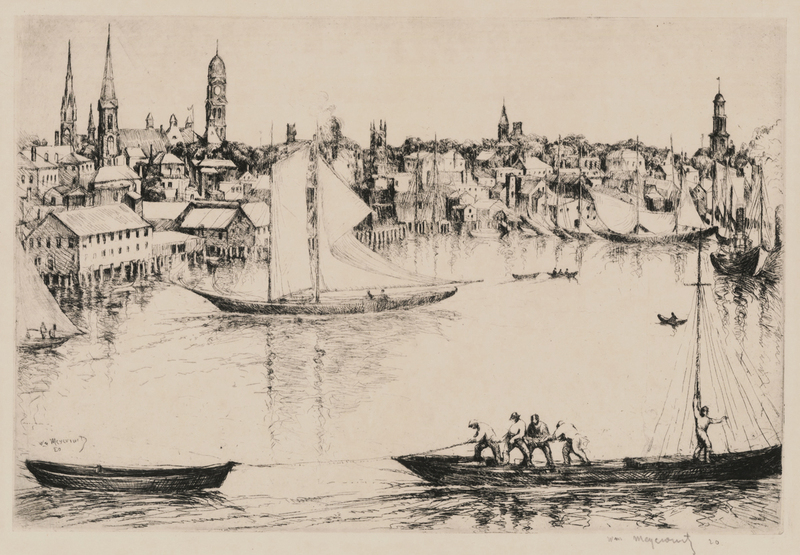 A beautiful etching by John Taylor Arms measuring 12 3/8 x 17 3/8 inches, pencil signed and dated, printed in 1945, state II, cat: Fletcher-390. 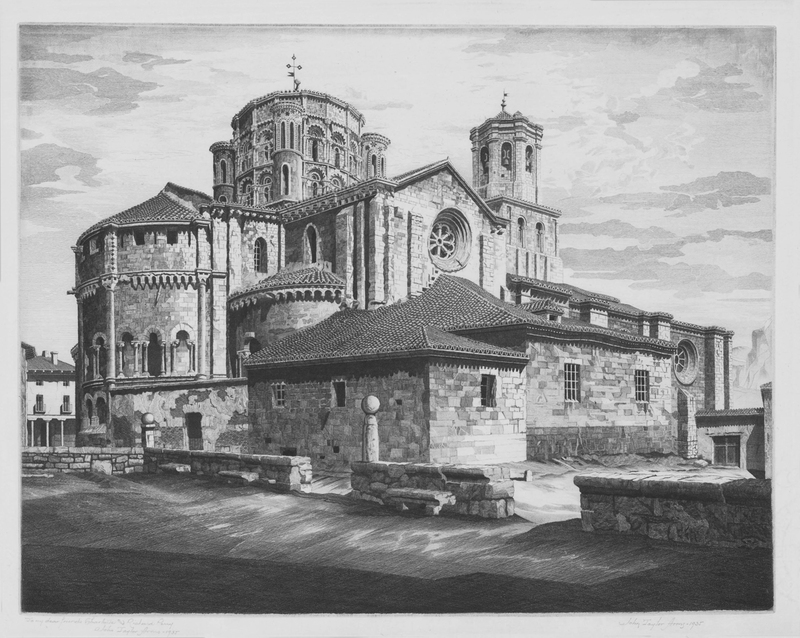 John Taylor Arms was an extremely talented and successful artist in the early 20th century, known especially for his exquisite renderings of French cathedrals and other European architecture. He served as a naval officer during WWI and at the onset of WWII was ready to serve again, but did not meet the Navy's physical requirements. Instead, Arms created his "U.S. Navy Ship Series," to support the American war effort. This is a beautiful original lithograph by American Regionalist artist John deMartelly. The image size is 13 1/8 x 13 5/8 inches, 1937, pencil signed. John deMartelly studied at the Pennsylvania School of Fine Arts, as well as in Italy and London. He was close friends with Thomas Hart Benton, with whom he taught at the Kansas City Art Institute for several years, before becoming the artist in residence at Michigan State University. DeMartelly was known for his regionalist style, most often depicting scenes of rural American farm life. He owned a home in rural NH, and was known to have portrayed his neighbors in many of his images. Etching and aquatint from 1937. Edition of 250. Published by Associated American Artists in New York. Pencil signed in the lower right. Plate size 11 3/4 x 8 1/2 on 15 x 11 3/4 inch wove type paper. Harry Sternberg was born and educated in New York City, His lithographs are in the permanent collections of the Museum of Modern Art, Whitney Museum, Fogg Museum at Harvard, Addison Gallery of American Art, Metropolitan Museum, Library of Congress, Ohio University, Victoria and Albert Museum in London, Bibliotheque Nationale in Paris, and others. This is an original hand signed lithograph by American artist Stow Wengenroth. 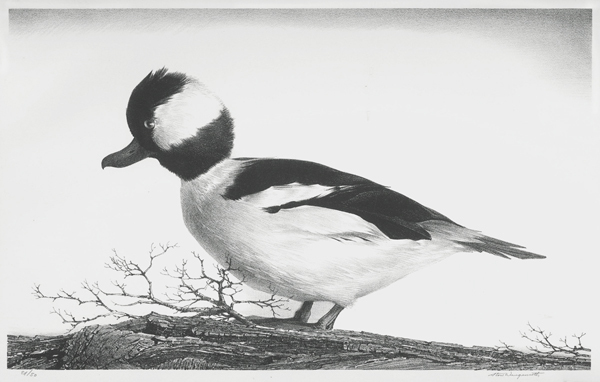 The title of this piece is "Bufflehead", it was created and printed in 1967 in an edition of only 50 signed proofs. The image measures 9 3/4X15 7/8 inches. 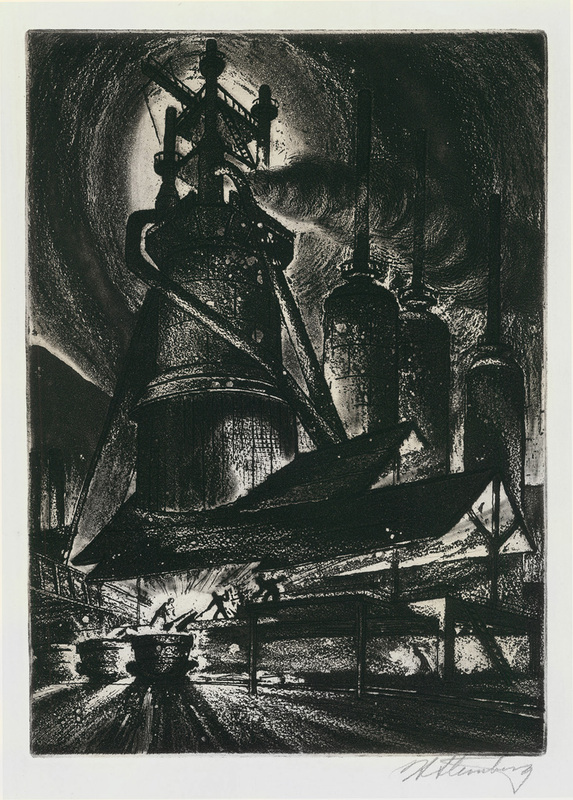 This lithograph appears in the Stuckey catalog as image number 312. Very good condition, matted not framed. This is an original etching by American artist Isac Friedlander. 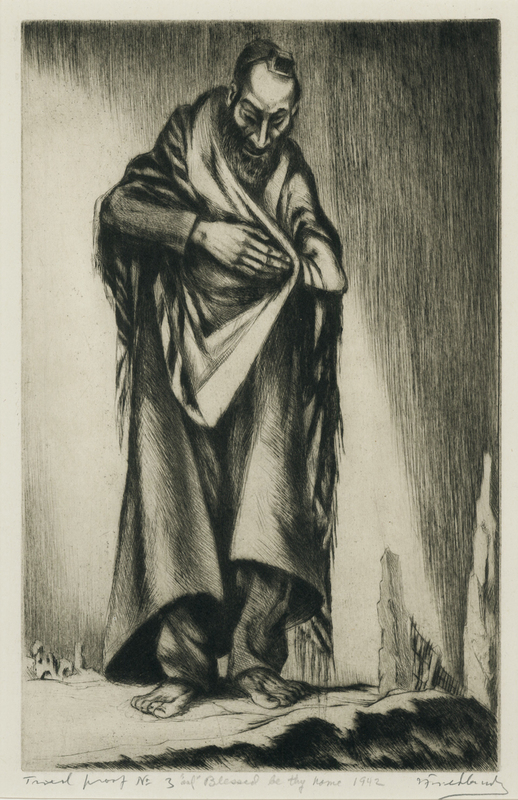 The title of this work is: "Blessed be thy name", it was created and printed in 1942. The image measures 12 3/4X8 1/4 inches. The artist's view of the aftermath of war in Europe. It is hand signed, titled, dated and inscribed as "Trial Proof No3" in the lower margin by the artist in pencil. Isac Friedlander (1890-1968) was born in Mitau, Latvia. He was arrested in 1906 and imprisoned by Russian authorities for anti- Czarist Political activities from 1906 to 1912. He studied art at the Academy of Rome, Italy from 1913 until 1917. He was a friend of Russian writer Maxim Gorky. Friedlander began his printing career in 1915. In 1917 he repatriated to Russia during the Kerensky regime, but in 1929 Friedlander immigrated to the US with the encouragement of his cousin Joseph Hirshhorn.